is a service oriented commodity trading firm; Series 3 licensed and an NFA Member. We strive to offer the services and tools necessary to assist you to succeed in your commodity trading plans; whether you are a beginning novice trader, or an experienced veteran. Our rates are competitive and our service second to none. Contact one of our friendly brokers today. "A World Ahead of The Competition"
*All rates per side. Not all clients will receive a 50 cent rate. Accounts requiring broker assistance will be charged a higher rate. Exchange, regulatory, and routing fees apply depending on platform and order routing selections. Some trading platforms are free and some have a monthly fee. Inquire with customer service to choose the right trading platform for you. All rates quoted per side/contract. 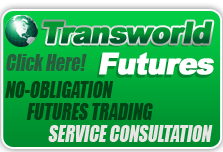 Transworld Futures is a service oriented commodity trading firm; Series 3 licensed and an NFA Member. We strive to offer the services and tools necessary to assist you to succeed in your commodity trading plans; whether you are a beginning novice trader, or an experienced veteran. Our rates are competitive and our service second to none. Contact one of our friendly brokers today. Multiple Trade Routing Solutions - Rithmic, CQG, T4, Certigo, and TT. Trade Futures, Options and Option Spreads all on the same platform. Free Firetip simulated trading $50,000 test account- a simple, risk-free way to try out the Firetip trading platform. Professionally Managed, Full Service, Broker Assisted, Self-Directed, and Deep Discount Online accounts. Jim Wyckoff's Daily Market; Early Morning Report; Bi-Weekly Newsletter and Top Trading Opportunities. The Firetip state of the art online trading platform- Trade directly from the chart; includes trailing stops, bracketing, OCO, scale-in/scale-out, reverse position and more. Create your own spread charts using the Firetip platform. Personally assigned brokers. We do not relegate your account to a trading desk. Trading platforms for every level of online trader with a number of different trade platforms to choose from. Online account review; Low day trading margins; $2500 account minimum. The following is a day in the life narrative involving 30 different commodities (bold lettering), all traded on U.S. commodity exchanges. After a good night's sleep, having been protected from outside elements by a home constructed of lumber, you wake and slip out from under a cotton sheet or quilt that has kept you comfortable and warm. You then go to the kitchen and prepare yourself a cup of coffee, maybe with some milk and sugar. You then fire up the skillet with a couple pieces of bacon, and put a couple pieces of whole wheat bread in the toaster, that you may decide to top off with some butter. On a cold day you might prepare yourself a hot steaming bowl of oats, or otherwise a hearty bowl of corn flakes. You then wash it all down with an ice cold glass of orange juice. After getting showered (copper plumbing) and dressed, maybe putting on some gold, silver, or platinum jewelry, you head to work in the your unleaded gasoline powered car, with toxic exhaust emissions reduced by a palladium coated catalytic convertor. You might stop along the way picking up a pack of smokes, or buying the daily newspaper, with your country's currency of issue - the U.S. Dollar. After putting in a few hours at work, you may decide to run down to the local fast food outlet for lunch and grab a hamburger (cattle), or maybe a hot dog (lean hogs) and some french fries cooked in either canola or soybean oil. After wrapping up your day at work you hop back into the car, and being a bit drained, pick up a chocolate bar (cocoa) for an energy boost on the way home. You then swing by the local auto store and pick up a couple quarts of oil (crude oil) for the car. Arriving back home for the day, you throw a couple of steaks on a natural gas powered, aluminum covered grill. While grilling, you might decide to crack open a beer (barley), as you begin to unwind from your day. Before retiring to bed, you check the financial news for the close on the S&P 500 Index, the Dow Jones Industrial Average, or maybe the NASDAQ, to get an idea how your company administered 401K plan fared for the day. Lights out, day over. In the above narrative, these are all physical or spot based transactions. Commodities however, can also be traded speculating on the future price of a particular commodity going up or going down, and personally profiting based on the correct determination. This is where the speculative aspect of commodity, or futures trading comes into play. Options on futures are a leveraged way of speculating on the price of a particular commodity going up or down, as with a futures contract, but all with a predetermined risk; i.e., the amount paid for the option- plus brokerage commissions and fees. If you believe the price of a particular commodity is going up, you would purchase a call option. Conversely, if you are looking for the price of a particular commodity to go down, you would purchase a put option. A simple way to remember this is that you call someone up and when done talking, you put the phone down. Call up; Put down. Trading futures theoretically leaves a trader open to unlimited risk along with ongoing margin requirements. Although a trader would generally stand to make more money on a correctly chosen futures contract, the limited risk of option trading in our estimation outweighs the benefits of an outright position in the futures market. Discount trading is a broker that specializes in trading options online. A futures broker can help you with an option trading strategy. Options are initially purchased, and then at some point during the trade closed out, or liquidated. If a purchased option is not closed out, the option itself, being a time sensitive instrument, will eventually expire worthless at a predetermined date, called the expiration date. This applies only if the option expires out-of-the money¹. An option expiring in-the-money² would be automatically exercised and you would be assigned a position in the futures market. Your profit or loss on an option trade is the difference between what you paid for the option, and the price for which it was eventually closed out, or liquidated. Unlike futures positions, as an option trade becomes profitable, the yet unrealized profits are locked into the option and not available until the option is closed out, or liquidated. 1.) Proximity to the underlying market is how close the strike price³ of an option is to the underlying market. The closer to the underlying market, the more expensive the option. 2.) Remaining time value is the number of days left on an option until expiration day. The more time purchased , the more expensive the option. 3.) Underlying market volatility is the daily trade range of the market. If the market is making fairly large price swings, the option tends to be more expensive. Conversely, if the market is making small prices swings, the option tends to be less expensive. It is of utmost importance to remember that when buying an option, time becomes your worst enemy. There is a depreciation curve associated with remaining time value on options that can increase rather dramatically as option expiration day grows nearer. Also, unlike futures contracts, options do not allow the effective use of a trailing or protective stop, therefore you need to have an objective with your trade. 1 Out-of-the money - A call option strike price above the underlying futures market. A put option strike price below the underlying futures market. 2 In-the-money - A call option strike price below the underlying futures market. A put option strike price above the underlying futures market. 3 Strike Price- also known as the 'exercise price'. The stated price that the buyer of a call option has the right to purchase a specified futures contract, or the stated price that the buyer of a put option has the right to sell a specified futures contract.